Chief Petty Officer Ron Banks, USN (l), and Senior Chief Adam Phillips, USN, familiarize themselves with the General Dynamics littoral combat ship (LCS) maritime information command center simulator. The simulator is being used to evaluate the center’s design and to help the LCS’ first crew learn about the ship’s interfaces. Training transforms to meet needs of initial crew. The U.S. Navy is developing the first group of hybrid sailors to serve on a vessel that is revolutionary in its technology as well as in how it will be manned and employed. To aptly prepare the crew members, the service is revamping some of its training curricula so these sailors can handle the multitude of tasks required in a totally systems integrated environment. This is the first time the groundwork for a ship’s manning as well as its training requirements is being based on job task analyses conducted across the enlisted community. The futuristic sea platform instigating this transformation is the littoral combat ship, or LCS. The first LCS, USS Freedom, is scheduled for delivery in December 2006. Though comparable in size to today’s frigate, the LCS sea frame is so technologically advanced that it will require less than half the crew of a frigate to carry out missions. The ramifications of this are far-reaching. A smaller crew puts fewer sailors in harm’s way and reduces logistics support. From a sailor’s perspective, professional opportunities will expand in ways unheard of in the past. Modularity and systems integration are built into both LCS designs, one created by a team led by the Lockheed Martin Corporation and the other by a General Dynamics-led team. The Navy has contracted to buy four LCSs—two from each team—and it will make a decision about purchasing additional ships in conjunction with other plans for the service. The Lockheed Martin platform is a 377-foot-long monohull that is 42 feet wide at the waterline and has a draft of 13 feet. General Dynamics’ design features a trimaran hull that is 417 feet long, 103.7 feet wide at the waterline and has a draft of nearly 15 feet. The top speed of both is more than 50 knots. According to Capt. Rick Easton, USN, commanding officer, Center for Surface Combat Systems, Dahlgren, Virginia, the LCS is revolutionary across the board. Rather than equipping it with capabilities to handle a multitude of missions, a module or modules tailored to address particular threats or tactical environments will be installed on the ship when needed. Currently, the Navy’s priorities are mine warfare, antisubmarine warfare and surface warfare; however, the service also is considering other modules such as intelligence, surveillance and reconnaissance, homeland defense and special operations forces support. Both ship designs feature integrated systems that significantly reduce the manpower required to operate the ships and the technologies. “It is what I like to call, and this is my term, ‘mission-critical manning.’ The littoral combat ship is designed to operate and deliver its combat power with a minimum number of individuals at sea, relying on distant support,” he states. Accordingly, sailors must expand their knowledge and be able to multitask using complementary skills, he adds. Although the LCS sea frame is comparable in size to a frigate, crew size cannot be compared absolutely. While a frigate goes to sea with a crew of approximately 200 on board, plans for the LCS sea frame call for it to be manned by a core crew of 40 personnel: eight officers and 32 enlisted personnel. If a mission involves the use of helicopters, an aviation deck crew of 20 individuals is added to support helicopter operations. Because the LCS’ capabilities are modular, further additions to the crew will depend on the specific mission. Module crew size may vary, but Capt. Easton relates that the current proposal calls for 15 sailors to embark with the ship in a particular module. “So that would bring the total for the LCS up to 75, which is still certainly optimally manned and, as I say from my perspective, mission critically manned,” he states. Additional personnel will be stationed ashore to provide the significant support that today resides on board legacy platforms. Satellite communications, increased bandwidth and overall computing power enable this reach-back capability and will increase efficiency across several ships, the captain notes. Recognizing that a traditional approach for assigning sailors to ships would not be adequate for LCS crews, the Navy analyzed job tasks, identified the required skills and crafted what it calls Human Capital Objects (HCOs) that comprise information about work, workers and workplaces. HCOr refers to the work and workplace requirements; HCOi refers to the individual with the skills to accomplish the tasks. “This is the first ship for which we developed Human Capital Objects to determine the manning requirements for operating the systems, manning the watches, doing the occupational work and executing the collateral duties. By defining in the job task analysis the work done by sailors in terms of skills, we were able to look across legacy ratings at things that were similar. So, for information technology tasks—whether it’s communications, radar, computers that drive tactical programs—they were defined many times by the same skills, certainly the same enabling, knowledge-based skills,” Capt. Easton explains. The task force that created the HCOs for the LCS comprised three officers and 10 enlisted systems experts representing the ratings to be assigned to the ships. The captain allows that the Navy has made its decision about certain LCS systems, such as propulsion and weaponry, so building the crew and training on the maintenance of those items can be done. However, the total integration of the systems as well as training in this regard is still under development and is scheduled for delivery next summer. A plan that flows the training at the right points in time has been developed, he adds. Creating the training curriculum for the LCS sailor also is a transformational effort. The vast majority of the current program of study comprises legacy courses, Capt. Easton admits, so the Center for Surface Combat Systems has made curricula that applies to the LCS crew a top priority for re-engineering into technology-based products that will facilitate the training tracks. Simulation technology will provide greater interactivity for the practicum portion of study. “We’re moving to computerized knowledge-based information whenever possible,” he states. But legacy courses have by no means gone by the wayside. In fact, Capt. Easton says these courses provide the training pieces, and when appropriate, an LCS crew member takes the entire course. The captain offers the total ship computing environment (TSCE) manager, known as HCO number 9, as an example of the kind of cross-training an LCS sailor requires. On the LCS, this crew member will man what on legacy ships are the radio room, the computer room and the radio equipment room. Traditionally, these spaces are occupied by numerous personnel who process radio message traffic; repair, tune and patch radios; or operate dedicated systems in areas such as antisubmarine warfare. However, the LCS’ design revamps this configuration, and as a result, the TSCE manager must be cross-trained. “Technologically, one of the other key aspects that’s revolutionary in the ship is that we have a single computing environment that links all of the weapons systems into the same computer and plugs the mission module into that computing environment that also runs the ship’s navigation, engineering and all the administrative functions. So this is really the first time that we’ve had a completely integrated computing environment on a ship. This TSCE watch stander is the one who’s responsible for monitoring, maintaining, running and operating that computing environment. It’s a very big job, and you can see how it would then draw skill sets that cross all of our systems and all the various ratings,” the captain explains. To meet this training challenge, the Navy is turning to information technology whenever possible. “Any time that we put our hands on new training that hasn’t been developed previously, we are working with the program office to develop it in an IT [information technology] delivery solution that’s a blended solution and that fully leverages computer applications and simulation,” the captain relates. He emphasizes that LCS training is not always the top priority in revamping training; however, it is one of the priorities as the curriculum is being redeveloped or re-engineered. The LCS concept proposed by the team led by General Dynamics features a trimaran hull that is 417 feet long and 103.7 feet wide at the waterline. It is designed with an open architecture to accommodate mission modules and systems upgrades. Capt. Easton notes that the Center for Surface Combat Systems provides only the schoolhouse curriculum for the LCS sailors. Fleet training will continue to be part of the overall training process. The Navy has determined, however, that individuals must be qualified to the maximum extent possible when they report aboard. “When you have the optimum number of people—a critically manned crew—there’s not time to do training based on a large apprentice base of sailors aboard the ship. So we’re going to have to do that training ashore, and we’re going to have to do that training in the future aided by computer-based as well as simulation technology. We are moving today to purchase the shore-based operations trainer that’s going to provide functionality for what we have in the past known as the CombatInformationCenter, which in this ship is the MissionControlCenter,” the captain explains. 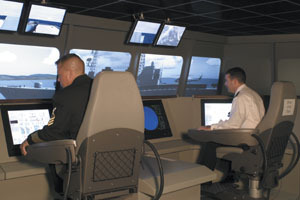 Computers and simulation also are likely to support training for the bridge operations because a number of systems management consoles will be located on the bridge, including navigation control, engineering plant management and combat systems, he adds. Among the overarching manning concepts being considered for the LCS is the Blue-Gold crew approach. Under the Blue-Gold crew construct, while the Blue crew is manning the ship, the Gold crew will be training. This approach is necessary to maintain sailors’ knowledge of the systems as they are upgraded; however, it poses some challenges, the captain admits. For example, if a deployed crew member must leave the ship because of a medical or other emergency, a trained replacement would have to be available to be forward deployed. Although a permanent crewing construct has not been chosen for all LCS ships, Vice Adm. Terrance T. Etnyre, USN, commander, Naval Surface Forces, and commander, Naval Surface Force, U.S. Pacific Fleet, chose to employ the Blue-Gold crew concept for the first LCS. In August 2004, the first 13 sailors were assigned to the Freedom; they began training in January 2005. An additional seven crew members have since reported for training, and the remainder of the crew is scheduled to arrive by the end of this year. Some of the second crew reported for training in October. The first crew will have completed its training well in advance of the scheduled December 2006 delivery date of the Freedom and will take possession of the ship. “The second crew will probably be doing some of its training in conjunction with the first crew, where it can be done efficiently, but the second crew probably will not be ready in the December time frame when the first crew actually reports aboard,” the captain notes. Capt. Easton believes that one possibility for the design of future LCSs may be a combination of the best features from each of the two current designs. But the captain is particularly excited about what the future holds for sailors. “If I was a sailor coming into the Navy today, this is the exact kind of ship I’d want to go to because it’s clearly cutting-edge technology. It’s clearly got the ability to broaden my personal capabilities probably well beyond even the hybrid sailors as we’ve designed them because they’re going to be supporting so many different capabilities. “If we look at other programs that have had small crews, such as the mine sweepers or the patrol hydrofoils in the past, those crews had to break out of their legacy rating construct and do many activities that stretch broadly across the platform in order for it to be as effective as it can be. I see a future where we’re going to leverage what we learn in LCS to make the future LCSs much better,” he states.